Doherty said his proposed Bill will ensure the code is put into primary legislation. A BILL TO prevent mortgages being sold without the consent of the borrower has been launched by Sinn Féin today. 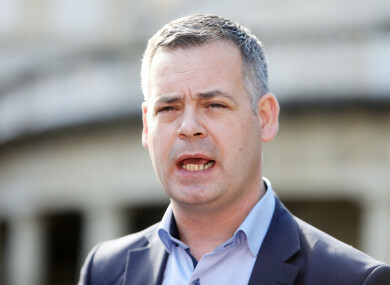 The party’s finance spokesperson Pearse Doherty said his new piece of legislation dealing with the issue of vulture funds is a new initiative which empowers homeowners to block the sale of their homes to vulture funds. Doherty’s Central Bank (Transfer of Mortgages) Bill puts into law what exists at the moment as a voluntary Central Bank code stating that lenders selling a mortgage must get the borrower’s permission before selling the loan onto a vulture. The issue of consent was recently raised by the deputy during an Oireachtas Finance Committee meeting when Doherty asked PTSB bosses if they would be adhering to the rule. Today PTSB confirmed to me they would apply Central Bank rules meaning a borrower must give permission before their mortgage is sold...they soon backtracked when I explained it to them. Doherty said the Central Bank’s Code of Practice on the transfer of mortgages is being ignored and banks “have turned a blind eye” to it because it is voluntary. He added that his proposed Bill will ensure the code is put into primary legislation. “The idea that we allow banks to just sell on to whoever, regardless of who they are, regardless of what their long-term interest is in the State, or how they will deal with those loans in the future without the consent of the borrower is simply not on,” he said. At a time when we see elderly people evicted from their homes in the dead of night and thousands of children living in hotels, this Bill aims to take action and put the power back in the hands of the people. The proposed legislation will come before the Dáil in January. Sinn Féin said it will take its campaign to the streets in the coming weeks and will host public meetings across the State. The government has accepted Fianna Fáil’s Bill in relation to the regulation of vulture funds, a Bill which Doherty said in the past he does support. The Fianna Fáil Bill, which was introduced by Michael McGrath, is currently being progressed with the support of Finance Minister Paschal Donohoe. However, Doherty said while regulation is a positive, the new law does not go far enough in terms of consumer protection. He said his Bill will give more power to the homeowner. Doherty said the banks, such as PTSB, have other options other than selling mortgages to vulture funds, however, they do not want to do this. He said the recent transfer of loans from PTSB is a “new low” in terms of how a bank treats its customers. “They know they can get away with this, the government has turned a blind eye,” he said, adding that homeowners know they are far more at risk when their loan is sold on. Doherty called on Fianna Fáil and Fine Gael TDs to support his Bill. Email “SF proposes new law to prevent mortgages being sold to a vulture fund without the borrower's consent ”. Feedback on “SF proposes new law to prevent mortgages being sold to a vulture fund without the borrower's consent ”.